I have been associated with the Hindu Samaj from the very beginning. I was then a 12-year-old boy. In that year, a few Punjabi Hindu expatriates met and conceived the idea to form a spiritual, social and cultural society. As far as I recollect, it was the first or second week of March or April 1925. I was there with my father. The main force behind the initiative was Pandit Ragunath Sharma. It was so appealing that everyone present agreed to it. 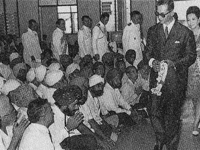 It was decided then and there to call a meeting of all prominent Punjabi Hindus. As a result, three successive meetings took place within three weeks to discuss the formation of the new society. Although I was very young, this idea impressed me so much that I attended all three meetings with my father. At the first meeting, 25-26 prominent Punjabi Hindus participated and unanimously agreed to the need for such a society. 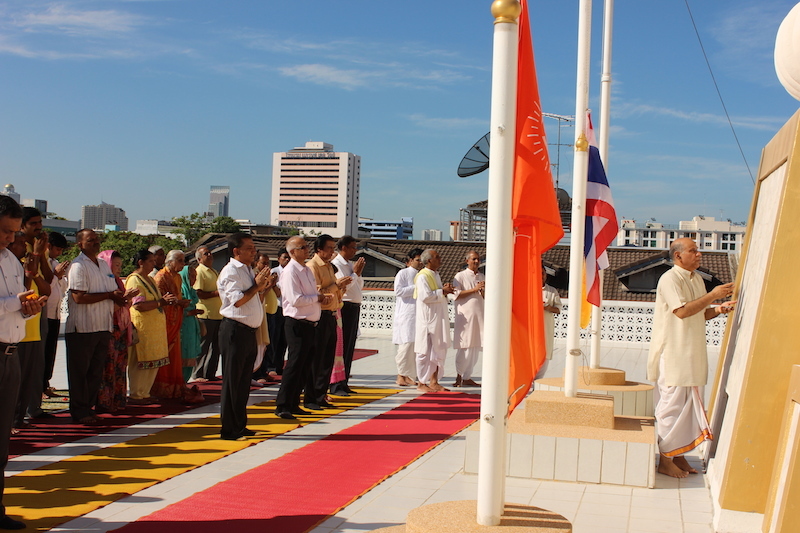 The second meeting was attended by 35-40 persons: the name Hindu Sabha for the association was suggested and passed; some funds were raised, about 500 baht, and some promised to contribute later; the office bearers were chosen. Master Hans Raj then advised that a shophouse near his home was available at 20-25 baht per month. Everyone agreed to rent it and Master Hans Raj was authorized to negotiate with the owner. At the third meeting, the number of participants was about the same as at the second: Master Hans Raj announced that the place for the Hindu Sabha was rented and that it would be ready in June to host the association; Pandit Ragunath Sharma suggested the inauguration should be on Vijaya Dashini Day in 1925. 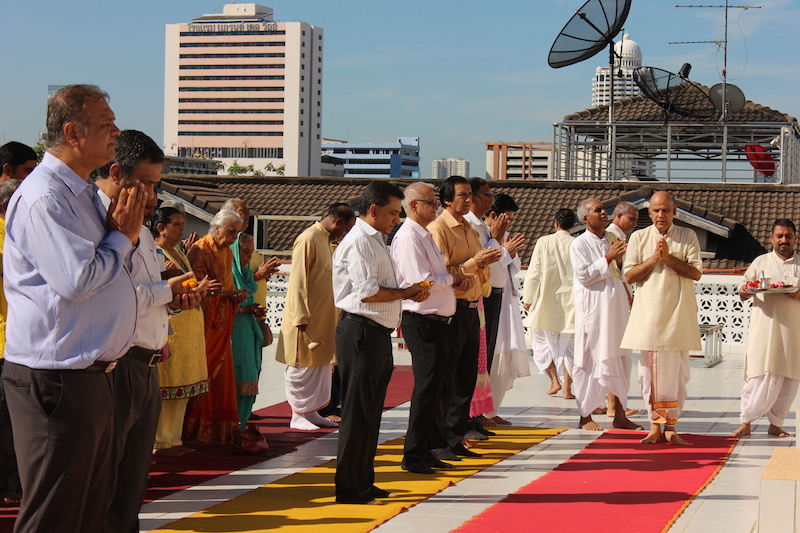 So the prayer hall was inaugurated on that auspicious day. 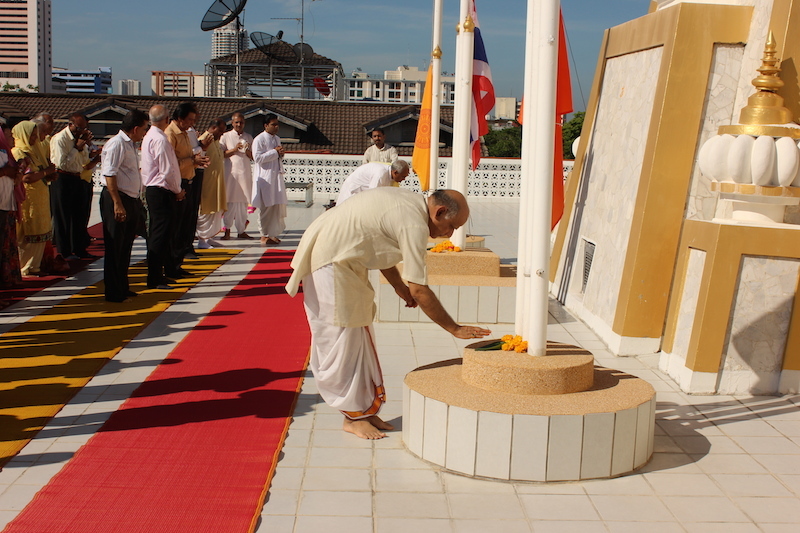 When the opening took place, it was the most significant moment for all Punjabi Hindus in Thailand. All Hindu shops were closed that day. Weekly satsang started immediately after: every Monday from 2000 to 22-2300 hours. Besides being the place for the satsangs, the Hindu Sabha become the evening meeting place of the community and its focus. This created in us a strong sense of unity and we were all closely knit together as we were part of a large family. This unity and love in turn brought prosperity to the entire community. By 1938, Punjabi Hindus were already considered a very successful business community. WWII started in Europe in 1939 and the Japanese invaded Southeast Asia on the 8th of December 1941. The war here lasted for four years until the Japanese were defeated in 1945. During these years (1942- 1945), the Hindu Sabha and all other Indian Associations were closed down and were inactive. In 1946, the Hindu Sabha reopened and started functioning as before but the weekly satsangs were moved from Monday evenings to Sunday mornings as they are today. About this time, the name Hindu Sabha was changed to Hindu Samaj. 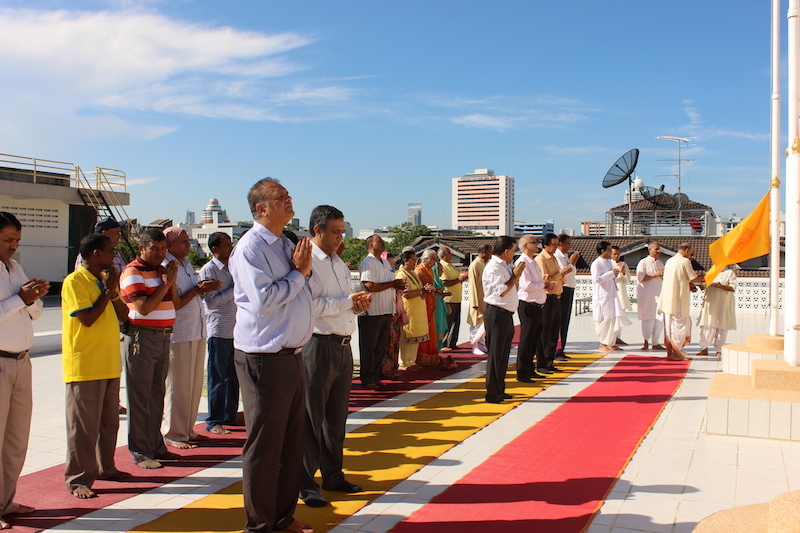 The present premises were acquired in 1948 and the foundation stone of the new building was laid by the then Indian Ambassador Shri Bhagwad Dyal, on Bisakhi Day, in 1949. 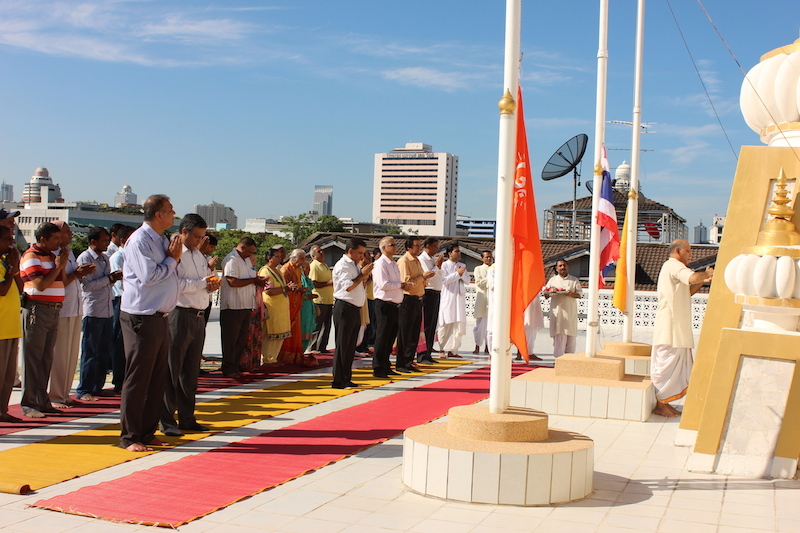 The Hindu Samaj progressed, attendance increased. Gradually, the members started feeling the need for a proper temple with consecrated idols. This idea gained a very strong momentum in 1964-65. Work on the Dev Mandir started in 1967 and was completed in 1969. 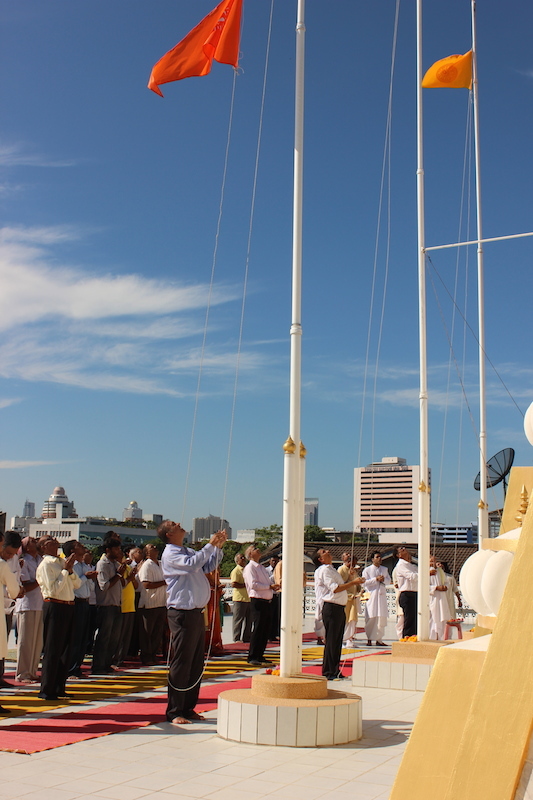 Thanks to the efforts made by various committee members and in particular by Pandit Ragunath Sharma, His Majesty King Bhumibol Adulyadej graciously agreed to perform the inauguration ceremony of the Temple. 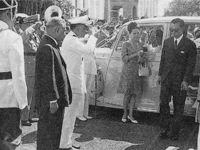 On the 11th of June, 1969, Their Majesties the King and Queen came and graciously inaugurated the temple. Their Majesties even more graciously spent about two hours in the temple and asked information about all the Deities represented by the idols. It was the greatest moment and honour for our community.